Kurtosh is a bakery that specializes in chimney cakes with various locations in Sydney. My boyfriend was recommended this bakery by his friend so he stopped by to pick up some treats for me at their Crows Nest location. Yay! As you can tell from the photo below, he didn’t get a chimney cake so maybe I can try that another time. 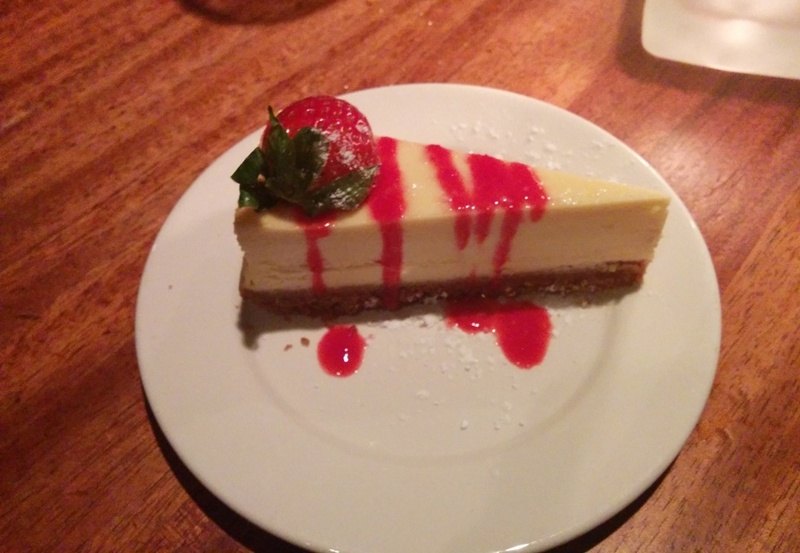 This entry was posted in Sydney Food and tagged cheesecake. My company had our Christmas party in Whistler this year at the Wild Wood Pacific Bistro. I was in charge of researching restaurants and we chose this one because they had the best set menu price. Wild Wood Pacific Bistro is located inside the Crystal Lodge. We drove up on a Friday afternoon and explored Whistler Village for a bit before heading to dinner. Actually I was really hungry before dinner so I popped into Purebread for a snack first! I just couldn’t resist and had to satisfy my big sweet tooth. If you didn’t know, I’m obsessed with Purebread and I should probably do an updated post since I go there so often. 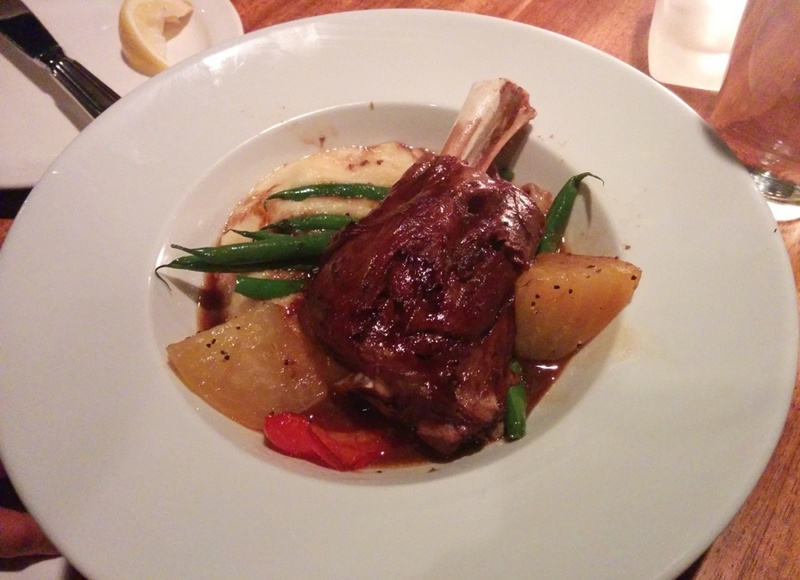 This entry was posted in Food Reviews, West Coast and tagged apple crumble, cheesecake, lamb, lamb shank. Trees Organic Coffee opened a new location on Broadway and Fir St. a few months ago. To celebrate, they hosted a giveaway on Instagram and on Facebook and the lucky winners would receive free cheesecake and drinks for themselves and 3 friends. I won the Instagram giveaway and redeemed my prize last month. I’ve been to Trees Organic Coffee quite a few times in the past and most recently, when they offered 50% off cheesecake for National Cheesecake Day over the summer. Their claim to fame is that they were voted “The Best Cheesecake in Vancouver”. They have various locations downtown. This entry was posted in Cafe/Bakery, Desserts and tagged cheesecake. Did you know there’s a food holiday for every day of the year? Sadly there aren’t enough restaurants that celebrate them or it would be too costly. For National Cheesecake Day this year (July 28th), Trees Organic Coffee offered cheesecakes for 50% off! They are voted Vancouver’s best cheesecake and they have a few locations around Vancouver. I went to the one on Granville Street beside Waterfront station. I love discounts/freebies (especially when it comes to food) and it’s close to where I work so I had to go! I thought there would be some crazy line ups but it was pretty tame. The wait was about 15 minutes or so. This is in contrast to that time I waited for an hour at IHOP for National Pancake Day (NEVER AGAIN). This entry was posted in Desserts and tagged cheesecake, desserts. 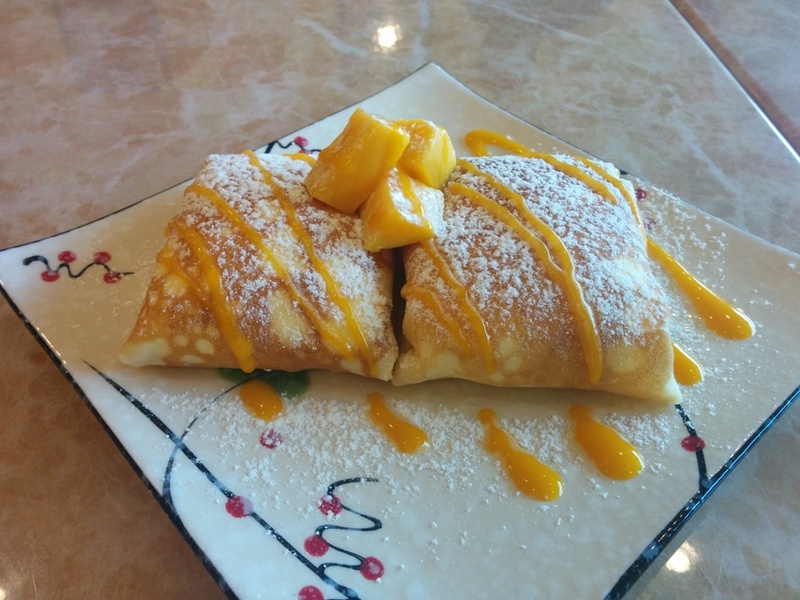 Mango Mama is the newest Asian dessert place in Richmond. The name is reminiscent of Mango Yummy and you can expect similar dessert items from them. Mango Mama is located in the plaza across from Aberdeen below Ninkazu. A few years ago, this used to be Cafe Waraku, a Japanese style pasta cafe. This entry was posted in Desserts and tagged cake, cheesecake, mango, pancake, shaved iced. The Sandbar actually extended their Dine Out menu to Feb. 8th which was when I went with my friends. Yeah it’s a little late to be posting it but you can always check it out next year! The restaurant actually has three floors and they also had a live pianist sing and play after a certain time that night which was really nice. It really added to the ambiance which was the dark and candle lit kind. 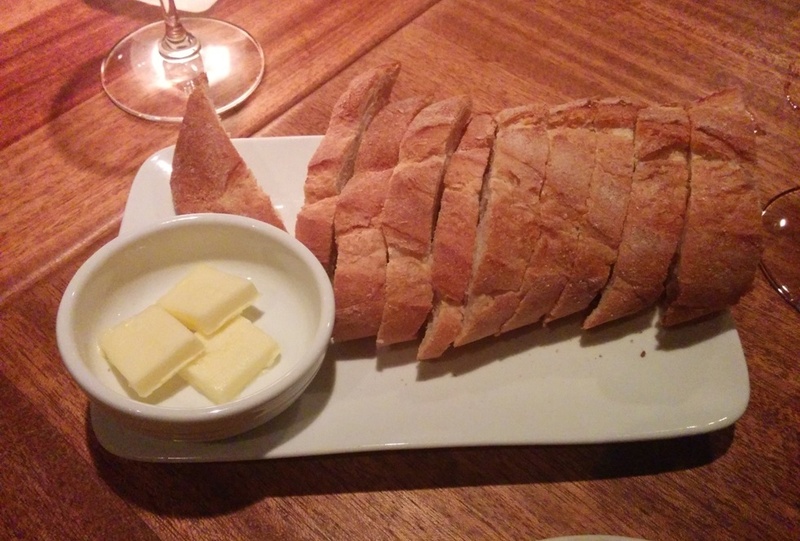 We started off with some warm Complimentary Bread. It looks like a lot but it was for five people. 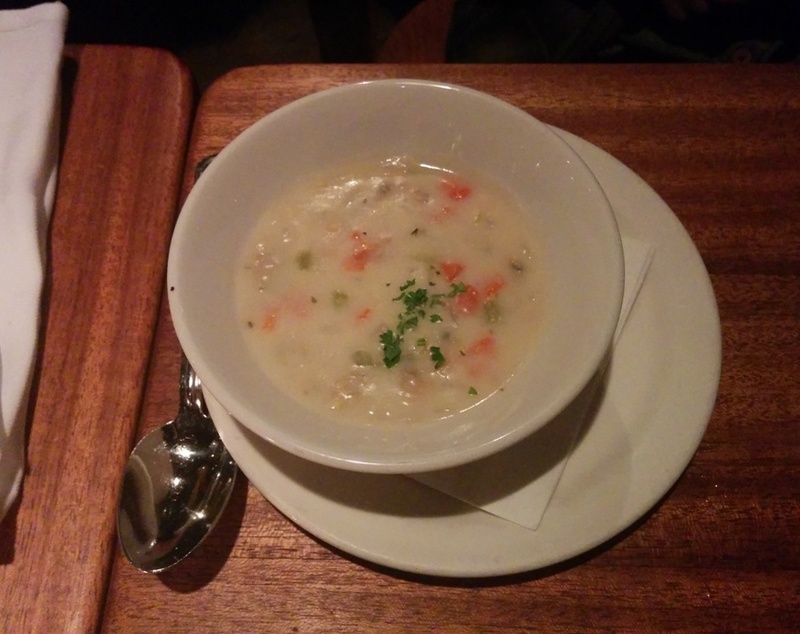 This was the House Made Clam Chowder, a popular starter dish at the table. I tried some of this and it was rich and creamy! Not that much clam though. 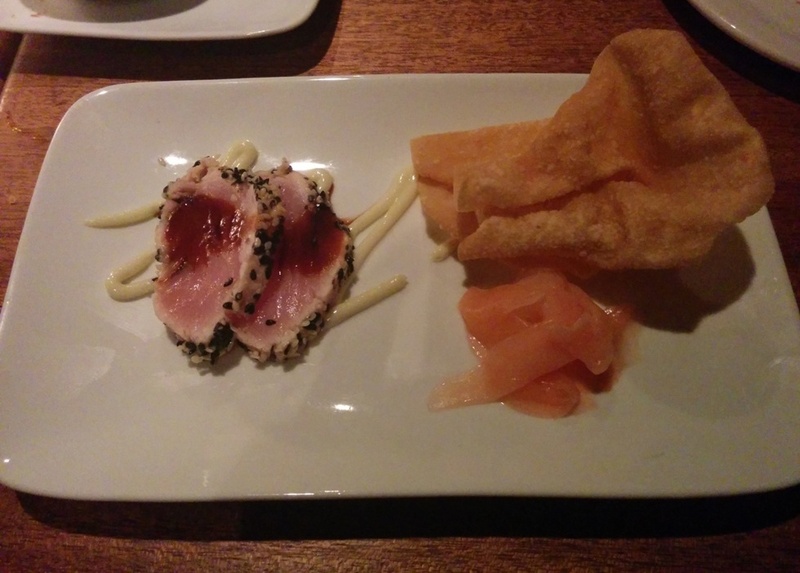 I had the Wok Charred Albacore Tuna with wasabi aioli, crispy wontons and pickled ginger. The tuna was lightly seared and crusted with sesame on the sides which gave it a slight nutty flavour. The tuna was really soft and almost melted in your mouth but the wasabi aioli could’ve had more of a kick to it. I avoided the crispy wontons though since they don’t usually taste like much. Wish there was more tuna though! 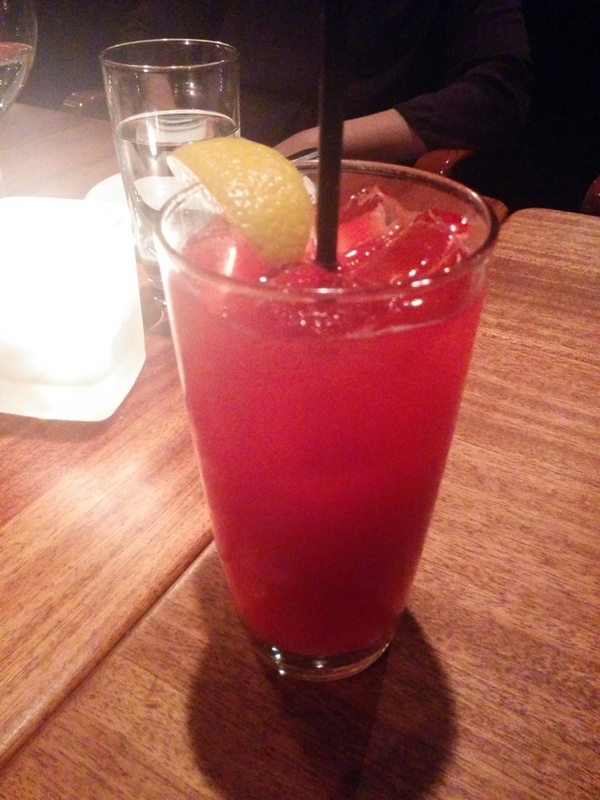 This was the Raspberry Lemonade (not part of the dine out menu). Actually not very sour despite the ingredients in this! I thought it was well balanced and tasty. 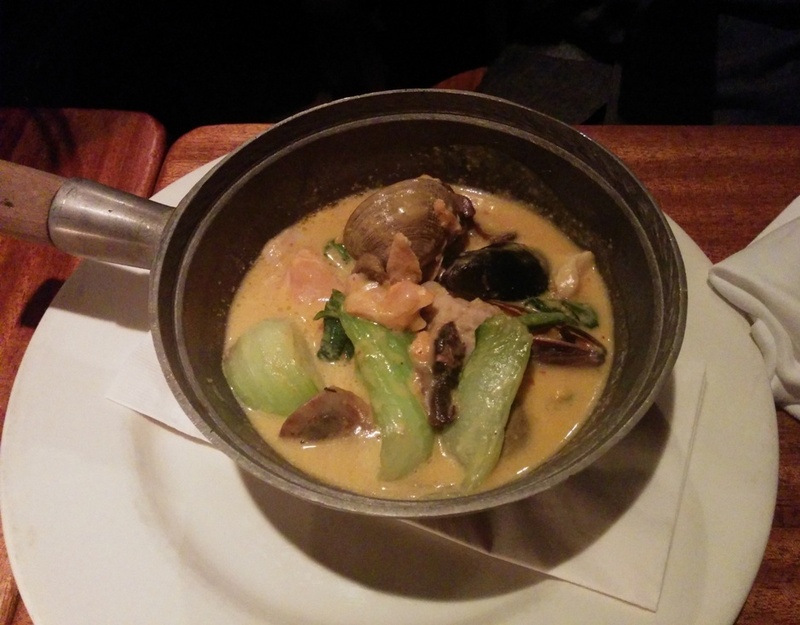 This was the Seafood Hot Pot with salmon, snapper, clams, mussels, prawns, scallop, and red coconut curry. Didn’t try this but we ordered extra complimentary bread so my friend could dip it in the sauce! 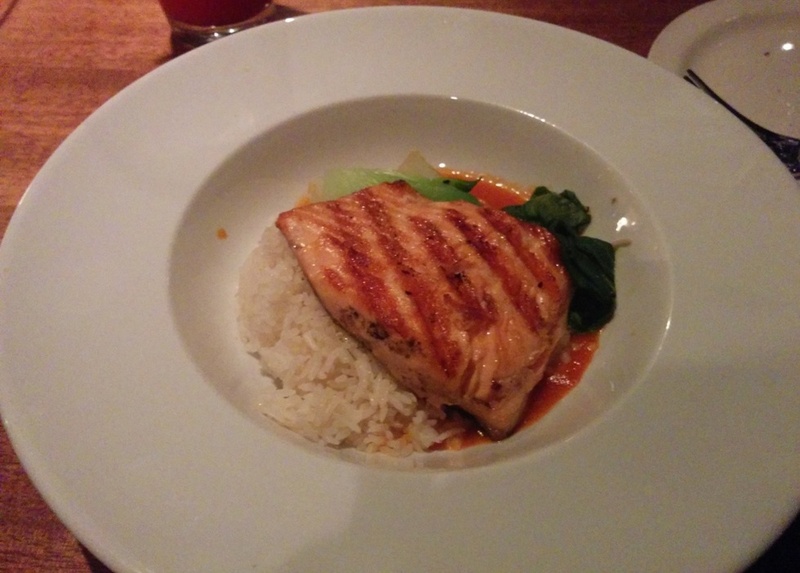 This was the Wood Grilled Steelhead Salmon with tomato fennel broth, coconut jasmine rice and bok choy. Whenever I see bok choy, it makes the dish feel a lot more Asian! I could really taste the wood flavour in the skin of the salmon and it was a pleasant interesting flavour. The salmon was also not over cooked! It was moist and flaky and I could taste the wood flavour occasionally. I felt that the tomato fennel broth was a bit weak though and the rice felt too broken up. For dessert, here we have the Lemon Cheesecake with raspberry coulis. There was just enough lemon flavour present and you can taste the creaminess of the cheesecake. The cheesecake didn’t actually feel that heavy. 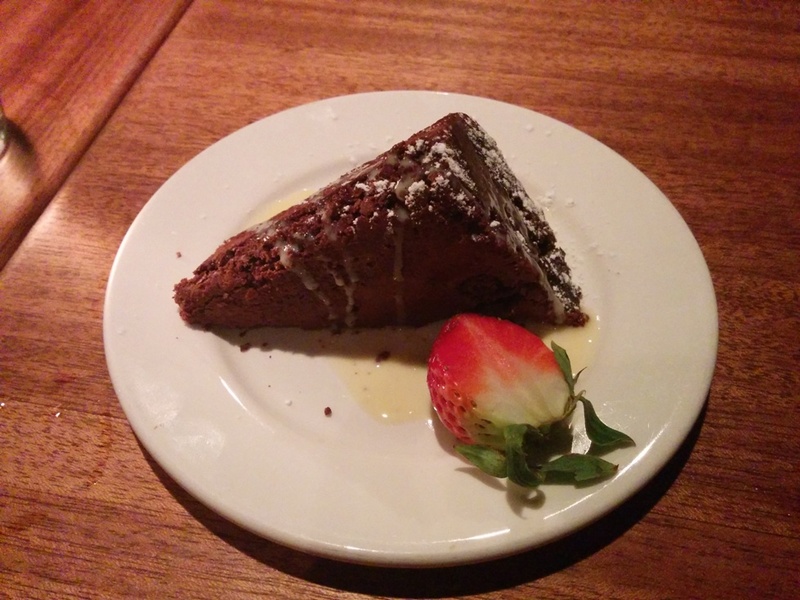 This was the Chocolate Oatmeal Brownie served with a creme anglaise. The brownie was chocolatey and moist but may be too sweet for some. This entry was posted in American/Burgers, Food Reviews, West Coast and tagged brownie, cheesecake, clam chowder, dine out Vancouver, lamb, lemonade, salmon, tuna. 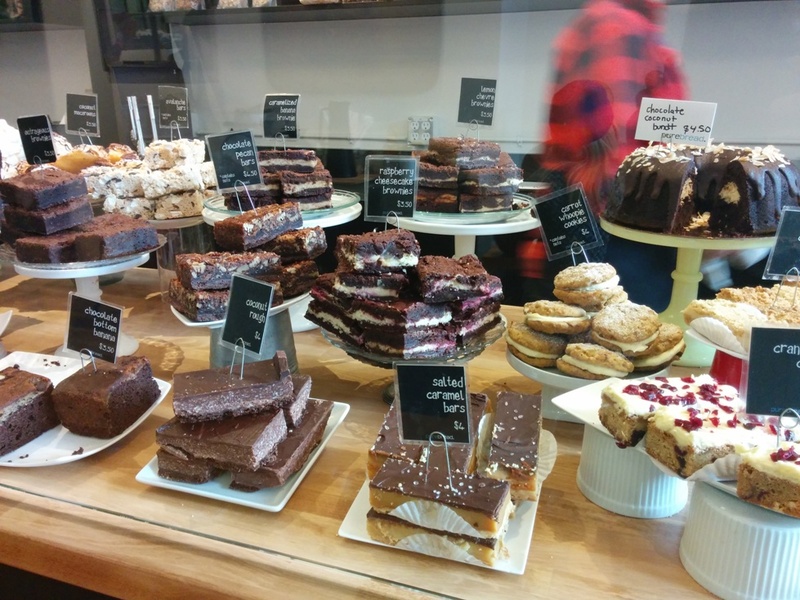 Purebread bakery has opened up in Gastown around the corner from Meat & Bread! Once you walk in the spread of goodies on the counter is unbelievably enticing. It took me ages to decide on something. It’s a feast for the eyes and the stomach. See pictures below! I had such a hard time deciding that I had to ask the server for recommendations. I believe she said that the salted caramel was her favourite and the Nutella brioche was also good. EVERYTHING LOOKED GOOD. Unless you don’t like sweets. Then you should really stop reading this now. This entry was posted in Cafe/Bakery, Desserts, Food Reviews and tagged brownies, cheesecake, desserts, lemon, sugar buns.